In Sumerian mythology, Nanshe (Sumerian: 𒀭𒀏 dNANŠE) was the daughter of Enki (god of wisdom, magic and water) and Ninhursag (earth and mother goddess). Her functions as a goddess were varied. She was a goddess of social justice, prophecy, fertility and fishing. Like her father, she was heavily associated with water. She held dominion over the Persian Gulf and all the animals within. Her seat of power was the Sirara temple, located in the city of Nina. Her consort was Nindara. Nanshe's birth is described in the Sumerian myth 'Enki and Ninhursag.' In the tale, Enki consumes several forbidden plants under the protection of his wife. In retaliation, Ninhursag places a curse on him. Enki soon becomes crippled with ailments, and the gods are left helpless. Enlil, the powerful sky god, manages to ease Ninhursag's anger after sending a fox, a sacred animal of Ninhursag, to speak with her. She then returns to Enki's side and lifts the curse. To heal Enki, Ninhursag gives birth to several healing gods. Nanshe was meant to heal her father's neck. At the conclusion of the myth, she is betrothed to the god Nindara. 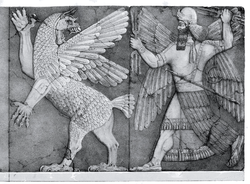 Nanshe's father, Enki, was later tasked with organizing the world and assigning every god a function. Nanshe was assigned dominion over the Persian Gulf, on which floated her father's awe inspiring sea shrine. As a secondary function, she was to ensure that shipments of fish reached the mainland. When heading onto the mainland, she sailed by barge from the Gulf. She had a strong connection with wildlife, especially birds and bats. In one hymn, she converses with ravens and pelicans, among other species. During the time of Gudea (2144 - 2124 BC), many hymns to Nanshe appeared showing her in an elevated position in the pantheon. She was the widely worshiped goddess of social justice. She nurtured orphans, provided for widows, gave advice to those in debt, and took in refugees from war torn areas. Several other gods appeared to be under the command of Nanshe. Hendursag and Haia were her assistants. Nisaba, sometimes portrayed as Nanshe's sister, was her chief scribe. On the first day of the new year, a festival was held at her temple. People came from all over the land to seek her wisdom and aid. Visitors were cleansed in the river of ordeals and then, if worthy, given an audience with the goddess. Nanshe settled disputes and handled court cases amongst mortals. Holding a higher ranking in the pantheon during this era, Nanshe sometimes shared the same tasks as Utu, the traditional god of justice. She sat on the holy thrones with the other prominent gods, and was seen as a goddess of protection. At one point, Ninurta, the mighty god of war, turns to her for guidance. Nanshe had the ability to give oracular messages and determine the future through dream interpretation (Oneiromancy). Her priests were also granted these abilities after conducting a ritual that represented death and resurrection. Despite the ritual, Nanshe is not depicted as life-death-rebirth deity in any known hymns or myths. In the Nanše Hymn she is described as having a role seeing that weights and measures are correct. 223-231: The guarantor of boundaries, the expert in (?) righteous words, lady, wise woman who founded Lagac ... with Jatumdug. ... righteous words for (?) Nance. The exalted lady whose commands are ... the lady who like Enlil determines fates, who is seated on the throne of Sirara -- she, the pure one, looks at her powers. 241-250: To weigh silver with standard weights, to standardise the size of reed baskets, they establish an agreed ban measure throughout the countries. ... of (?) all the great rites. After ... in (?) the established storerooms, the lady of the storerooms ... her lofty ... with (?) vessels with ever-flowing water and with (?) ... of (?) reed containers which never become empty, she ordered her herald, lord Hendursaja to make them profitable (?). 20-31 She is concerned for the orphan and concerned for the widow. She does not forget the man who helps (?) others, she is a mother for the orphan; Nance, a carer for the widow, who always finds advice for the debt-slave; the lady who gives protection for refugees. She seeks out a place for the weak. She swells his collecting basket for him; she makes his collecting vessel profitable for him. For the righteous maiden who has taken her path, Nance chooses a young man of means. Nance raises a secure house like a roof over the widow who could not remarry. Nanshe has two major symbols, both of which are also seen in Christian folklore. The fish represents her original role as a water and fishing goddess. The pelican, said in folklore to rip open its own chest to feed its young, represents her role as a protector and caregiver. ^ Jordan, Michael (1993). Encyclopedia of gods : over 2,500 deities of the world. Internet Archive. New York : Facts on File. p. 183. "Nanshe, at TheMystica.com". Retrieved July 22, 2006. "A Hymn to Nanshe". Oxford University, ETCSL. July 9, 2001. "A shir-namshub to Ninurta". Oxford University, ETCSL. 1999. Veldhuis, Nieke (2004). Religion, Literature, and Scholarship: The Sumerian Composition Nanŝe and the Birds, with a Catalogue of Sumerian bird names. Cuneiform Monographs 22. Leiden: Brill. New edition and translation, with full commentary. This page was last edited on 27 January 2019, at 15:29 (UTC).